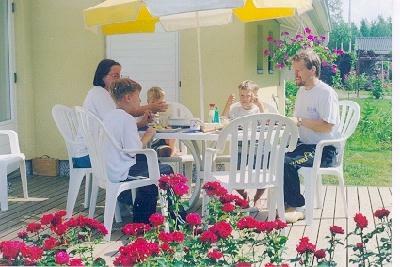 The Syrjamaki Family: Heikki himself, his wife Merja and the kids, Taneli, Aleksi and Oskari. Here are the other members of the Family: the '68 (at the left) and the '69. I live in Tampere, Finland. This is the third biggest town in Finland, about 100 miles north of Helsinki, the capital of Finland. I was born in 1957 and I am married with three kids. Like almost every one in Finland, I am a car racing enthusiast. But mostly I have been interested in old cars, mainly Volkswagens. 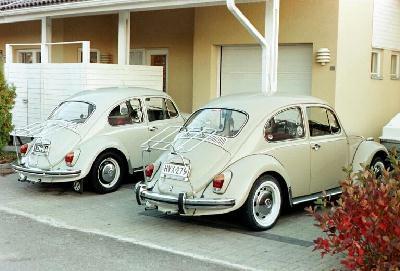 It looks like I am specialized in VW 1500 Bugs. I own a 1968 VW 1500 Bug and a 1969 VW 1500 Bug! My 1968 is registered as a historical vehicle. It has been driven only 60 000 miles and is an unrestored car.1969 is my daily driver, yes also in the winter time. 1500 Typ 1s are great cars. They have 44 bhp, padded dash, disc brakes, and in Europe they are not automatic. I love to take part in the meetings and rallies for old cars. Also the Volkswagen mettings are fun! It´s great to see a convoy of aircooled Volkswagens. Some day I will take part in a VW meeting outside Finland, too. I wanted to have a Volkswagen home page of my own. 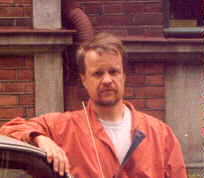 So I have learned some HTML and now my home page can be seen in http://go.to/heikki. Why Volkswagens? Because they are good looking, reliable, fun to drive, inexpensive, friendship with other volkswagenist is something really special (you know that VW-fraternity)... Well, my mother told me that I said at the age of three or four that when I grow up I would never get married, but I will buy a VW! Well, I am happily married and I own two VWs!! Heikki included a Link to the "Arte & Fusca - The VW Beetle and the Pop Art" Site in his Site, thus allowing the divulgation of the QUEST to more people around the world, helping a lot to proceed with the work!